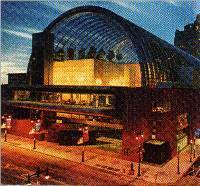 On Saturday, February 10th at 11 a.m., the MIT Club will meet in the reception area inside the front door at the Kimmel Center for a special behind-the-scenes visit to the Center to learn about the engineering, architectural, and management decisions that lead to a good concert. Verizon Hall is shaped like a cello with no columns to interfere with the view. To compensate for the lack of columns, great imagination was used to make the building work. Architect Rafael Vinoly has developed end walls of multi sheets of glass panels that can move as much as 32 inches in the wind since they are anchored only at the roof truss. The hall acts like a musical instrument, reverberating and reflecting sounds to enhance the acoustics. The hall is finished in mahogany. Doors lining the side walls can be opened into large, empty rooms that act as reverberation chambers to “enlarge” the sound. A three-part moveable canopy suspended over the stage holds spotlights and can be positioned to redirect sound coming from the stage – shades of Einstein’s “String Theory.” The Kimmel will provide guides with preference given to physics majors. The group will have a sneak preview of an upcoming organ recital when visiting the Performance Hall where we are a very select audience for an organ program rehearsal. There will be a special lunch served at the Center for your enjoyment.